When you pull into Big Sky, Montana, one of the first things you see is Lone Mountain. 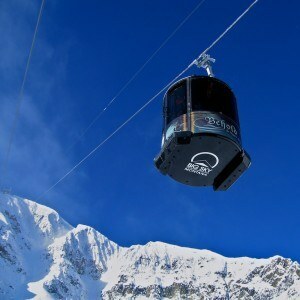 Big Sky’s signature summit dominates the skyline as you cruise up Montana highway 64 toward Big Sky Resort. 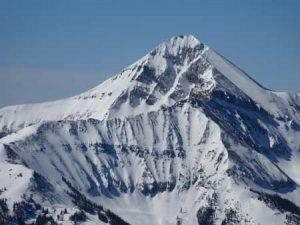 This towering peak sits at 11,166′ and offers some of the best inbounds big mountain terrain in North America. The Lone Peak Tram whisks 15 passengers at a time to the top of Lone Mountain where they can click into their skis or snowboard and instantly access world class big mountain terrain. Every run from the top is the real deal. There is no easy way down from the summit. And as the signs will tell you, it’s all avalanche terrain and knowledge of self arrest technique is mandatory. When you hear the booms of avalanche control work after a stormy night or wild wind event, that’s Ski Patrol working to keep the mountain open and safe. Hearing that familiar sound while sipping your morning cup of coffee, usually means it’s going to be a good day on the slopes. If you’re heading up, remember that Big Sky’s terrain is not like other resorts. Just because you can ski double black diamond runs at your home hill, it doesn’t mean you’re a double black diamond skier in Big Sky. The Big Couloir – Snaking through the rocks below the tram, this signature line requires you to sign out with ski patrol. Only 2 people are allowed into the Couloir every 15 minutes. Every skier/rider must carry avalanche gear – beacon, shovel, and probe – and know how to use it. The North Summit Snowfield – The Snowfield delivers max vertical from the summit of Lone Mountain to the base of the Six Shooter. This 4000’+ line offers technical skiing in a remote area that requires proper skills and route finding. The Headwaters – This zone of steep chutes can only be accessed by hiking. With tight chokes and gnarly exposure, the Headwaters are mentally and physically demanding. All of these zones offer steep, technical ski lines that have real consequences. Are you ready to test your skiing and riding skills? If you don’t have avalanche gear or you want someone to point you in the right direction, book a guide from the Big Sky Mountain Sports School. They can guide you through Big Sky’s big mountain terrain and provide the necessary gear if the guide feels you are capable of skiing that terrain. Or if you’re a go-getter, stop by any of Big Sky’s outdoor retailers to buy the gear you need. Please treat the terrain at Big Sky Resort with the respect that it deserves. They call it the Biggest Skiing In America for a reason.